It has been said the essence of Western cuisines is richness created by layers of different tastes while the essence of Japanese cuisine is simplicity created by eliminating all unnecessary flavors. Whether you are planning a gastronomic adventure or a classic journey, you can discover the delicious world of Japanese cuisine with freshness and healthy ingredients. DAY 1 Tokyo Arrive Tokyo Haneda Airport. After immigration & custom formalities, you will be transferred to Ginza Capital Hotel by airport limousine bus. Rest of the day is free at leisure and explore the neighbourhood of Ginza for its infamous upmarket shopping, dining and entertainment district. Dinner suggestion : Tokyo has the best sushi restaurants on earth, we will provide you with a list of the recommended sushi restaurants in Tokyo. 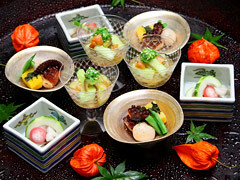 Kaiseki ryori is traditional Japanese multi-course haute cuisine using seasonal ingredients and prepared by using different techniques of Japanese cooking. Dinner suggestion : Kyoto is famous for its "Tofu", its sublime kaiseki cuisine and Buddhist vegetarian fare. 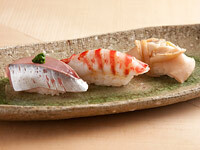 We will provide you with a list of the recommended restaurants in Kyoto. DAY 6 Kyoto - Hiroshima - Kyoto Morning departure by shinkansen train to Hiroshima and join a coach tour to explore Hiroshima city and Miyajima island. The colourful Itsukushima Shrine ~ Its red Torii gate built in 6th century, stand in the sea during high tide and is famous for its grand and unique contraction. Please try to sample the local delicacies of Hiroshima ~ Oysters (Kaki). There are some oyster shops that serve grilled oysters and vinegared fresh oysters to visitors on the Miyajima Island. Hiroshima prefecture accounts for approximately 60-70% of Japan's oyster production. Dinner suggestion : Hiroshima Style Okonomiyaki ~ Local version of the dish is characterized by only a thick layer of batter and a generous amount of cabbage on top of yakisoba noodles, with popular toppings like oysters, squid and bonito flakes. DAY 7 Kyoto - Tokyo Haneda Airport Board the Japan Railways Shinkansen bullet train to Tokyo Haneda Airport for your departure flight. Airport Limousine Bus transfer from Haneda Airport to Tokyo Station.